You may enjoy breakfast in your room or at the hotel restaurant before you meet our local guide who will be pleased to accompany you for a private tour by limousine to visit one of the Seven Wonders the great Pyramids of Giza; (Cheops, Chephren and Mycerinus) were reckoned by the Greeks to be one of the Seven Wonders of the World. A single pyramid is built with 2.300.000 blocks, each weighing an average of two and a half tones. In the face of such immensity, one cannot help but feel the wonder and awe that so many writers and artists have sought to convey over the centuries. The Cheops Pyramid is more interesting, because its interior burial chambers are open for inspection by the public. Not far from the Pyramids is the Great Sphinx of Giza, which dates from the time of Chephren (2620 BC). Hewn from natural yellowish limestone and standing 65 feet-high and 187 feet-long, this unforgettable statue combines the head of a Pharaoh with a lion's body. Enjoy breakfast at hotel before checking out, and then our local guide will accompany you for a private tour by limousine to visit the Egyptian Museum for unforgettable tour;Egyptian Museum; was established by the Egyptian government in 1835. The present museum building was built in 1900, in the new classical style by the French architect Marcel Dourgnon. The museum exhibited collections now exceed 120,000 objects ranges from pre historic era to the Greco Roman period. It has 107 halls, and the ground floor houses huge statues. The upper floor houses small statues, jewels, Tutankhamen treasures and the mummies. The museum also comprises of a photography section and large library. A hall for the Royal Mummies was opened at the museum, housing eleven kings and queens. 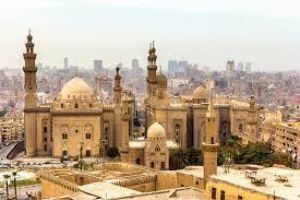 After the visit of the Egyptian Museum a short drive will take you to Khan El Khalili bazaars; which is one of the most famous worldwide with its amazing narrow alleyways. The visitor can discover small restaurants and workaday cafes where Egyptians & non-Egyptians come to smoke water pipes and enjoy some of the traditional Egyptian drinks in the cafes scattered around the area (Few years ago, Naguib Mahfouz himself used to come and sit beneath the huge, ageing and discoloured mirrors of the café). The Bazaars is always a part of most of the tourist programs as the tourists find it a great fun with bargaining experience to buy some souvenirs. The bazaar is the domain of shopkeepers and tourists. Jewellers, items made from copper, parquetry boxes, semi-precious stones, rugs, blown-glass dishes and other souvenirs.